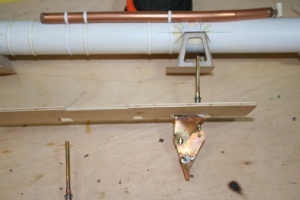 I followed the original plan for the torpedoes and made 4 prototypes, but was unhappy with the rather in-elegant switch and feared it would be unreliable. It did work as intended in the tubes, but was pretty tricky and touchy to adjust. More later on torpedo re-design. 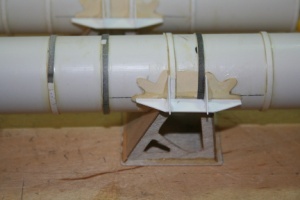 The torpedo tubes were detailed with various materials, using paper strips for the reinforcing bands, plastic for other details, 1/16″ plywood for the pedestals, and 3/8” copper for the compressed air chambers on the top of each tube. 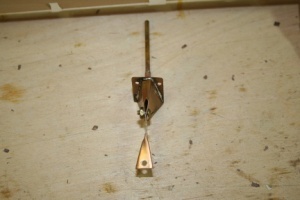 I made up some launching pins which are retracted by a servo. One channel operated the port side tubes, and a second the starboard tubes. Moving the channel control one way fires one tube, then the second direction fires the second tube. 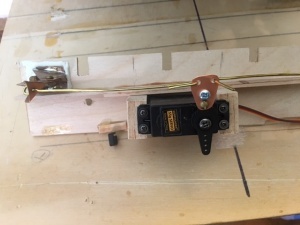 The wire from the servo arm passes through a hole on the trigger and ends in a loop, so the trigger doesn’t move when “pushed” but retracts only when “pulled”. 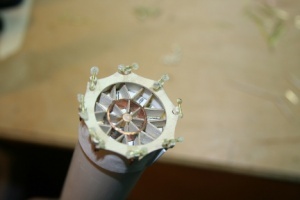 The launching pins extend up through the deck, through the rear pedestal mount of each tube, and through the wall of the tube, protruding about 1/8 inch into the tube interior. The pins engage small blocks on the torpedo. 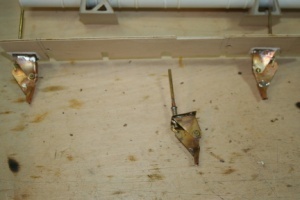 When the pins are retracted by servo action, the torpedo is launched about 4 feet. I used pretty beefy servos to make certain they were able to pull the pin when the torpedo was loaded in the tube against the spring pressure. The loading process is pretty simple. 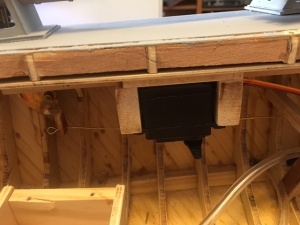 I use needle nose pliers to retract the pin on a tube, insert the torpedo with the retaining block down and slide it back against spring pressure until fully in the tube, then let the pin back up into the tube to engage the retaining block. The launching system is simple and works well.